Today is World Diabetes Day. It is the one day of the year that has been internationally recognized as the diabetes awareness day. All day, my social media accounts have been bombarded with awareness efforts, and it is truly amazing to watch the community come together over something so important. I issued a call to action on my Facebook page, urging my friends and family to wear blue (the officially recognized color) in support of the diabetics in their life, and take a photo of it. The response has been so touching. Today the Diabetic Online Community and the Food and Drug Administration came together and had open discussions about diabetes care, daily life, struggles, shortfalls, and hope. Why is this a big deal worth blogging about? Because this meeting is unprecedented. The FDA has always been viewed by many as a cumbersome, slow-moving, necessary evil of diabetic life. 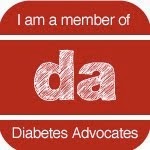 The fact that the FDA was so willing and open to meeting with key members of the diabetic community is incredible.